The Minister for Sport Shane Ross and members of Sport Ireland will appear before the Oireachtas sports committee to answer questions about the Football Association of Ireland (FAI). In an opening statement to the committee, seen by Broadsheet, the CEO of Sport Ireland John Treacy and chairman of Sport Ireland Kieran Mulvery are expected to say that Sport Ireland found the FAI delegation’s refusal to answer certain questions that the committee asked of it last week “disappointing”. They will say they expected the FAI to be “open and transparent” in relation to “all relevant issues”. Despite this refusal to answer certain questions, Sport Ireland will tell the committee that the organisation still “learned some information that we did not previously know from our correspondence and meeting with the FAI”. “The events of 2017, as described by the FAI, give rise to serious concerns on the FAI Board’s application of it’s governance and oversight role, as required under Sport Ireland’s Terms and Conditions of Grant Approval. 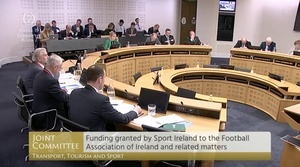 “In the course of the Board’s discussion [on April 9 when it decided to suspend funding to the FAI], it was noted that in the FAI’s written opening statement submitted to this Committee ahead of last week’s hearing the FAI acknowledged that Clause 4.3 of the ‘Further Reporting’ section of Sport Ireland’s Terms & Conditions of Grant Approval was not met. This relates to 2017, whereby the FAI did not notify Sport Ireland of any material deterioration in its financial position. 1. An audit of the sporting body’s governance and financial control. 2. The establishment of a liaison process with the sporting body to closely monitor, verify and support (as appropriate) the NGB’s implementation of the audit recommendations to verify compliance with the Terms and Conditions of Grant Approval. 3. The liaison process is overseen by Sport Ireland’s Audit & Risk Committee, with periodic updates and recommendations made to the Board. 4. Grant Funding is withheld until sufficient progress has been made on implementing the audit recommendations, and governance and financial control issues have been progressed. 5. Once progress is made on implementing the audit recommendations, and assurance is received of the effectiveness of governance and financial control, staggered payments are generally made to the NGB in question. Sport Ireland will follow this established process with the FAI, as it has in the past with other NGBs when similar situations have arisen. Sport Ireland’s Audit & Risk Committee meets on April 18th and will discuss the specific requirements, from a governance and financial control perspective that will be required of the FAI. “Depending on what emerges from the Mazars and Grant Thornton reviews, we will also consider a full audit of the FAI by Sport Ireland’s appointed auditors, as per Sport Ireland’s Terms and Conditions of Grant Approval. “The scope will be defined by Sport Ireland’s Audit & Risk Committee, and will be set with reference to our satisfaction with the scope and findings of Mazars review. “In light of the acknowledgement by the FAI that there was a breach of the Terms and Conditions this audit will be as broad and extensive as necessary to satisfy Sport Ireland that the FAI is compliant with our Terms and Conditions of Grant Approval, including that its internal financial controls and management, as well as its general governance, are of sufficient standard in order to restore funding. “The specific mechanisms to satisfy Sport Ireland on the effectiveness of the FAI’s governance and systems internal of financial control will be proportionate to the significant level of Sport Ireland investment in the organisation. “Sport Ireland is also very cognisant of the FAI’s engagement with the Office of the Director of Corporate Enforcement on their particular enquiries, which we understand to be substantial. “With regard to next steps, Sport Ireland has accepted the FAI’s offer of engaging with the FAI on the composition of their new Governance review group (to include a majority of external members) and to assist in identifying its external Chairperson. “Sport Ireland has identified a potential candidate and hopes to agree this with the FAI today (Monday April 15th). The terms of reference of this group will be agreed with Sport Ireland and finalised by the group once it is established. The statement also says Sport Ireland will liaise with the Minister for Sport Shane Ross before any decision is made with regards to restoring funding to the FAI. Posted in Misc and tagged Oireachtas sport committee, Sport Ireland at 4:34 pm on April 15, 2019 by Bodger. 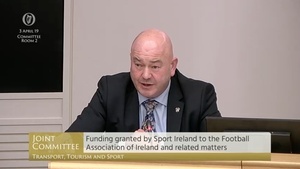 CEO of Sport Ireland John Treacy has started to give his open address to the Oireachtas sports committee in relation to the Football Association of Ireland. It follows revelations in The Sunday Times in recent weeks that the former CEO of the FAI John Delaney gave the FAI a “bridging loan” of €100,000 in 2017 – a loan Sport Ireland said it new nothing about – and that the FAI paid €3,000 a month in rent for Mr Delaney for several years while he was earning €360,000. In his opening statement, Mr Treacy said the FAI has not sufficiently explained the circumstances of Mr Delaney’s loan and, as of yesterday afternoon, the FAI had not responded to a second letter from Sport Ireland in which it sought answers. However, it did receive a letter late last night while a copy was handed into the SI office this morning. Sport Ireland CEO John Treacy has said after his group did not receive a letter from #FAI over #Delaney loan for a fortnight, it then received the letter late last night, with a copy handed into the Sport Ireland office at 10.40am today – just four hours before Dail meeting. Treacy reads out letter, before saying it again does not give any explanation for the €100k #Delaney loan to the #FAI, the exact circumstances of its repayment and why this information cannot in the FAI’s view be released at this stage other than to refer to the Mazars report. Treacy: “We will be writing to FAI probably in next day or so, expressing disappointment in timing of letter, secondly we will be raising the context of the letter which falls far short of both requests of Sport Ireland. 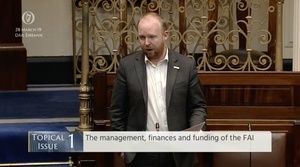 “I note the concerns expressed by Minister Ross with regards to media reports and your wish for clarification as to the circumstances of the short-term loan by the then chief executive to the association. “The association has engaged Mazars to carry out an independent review of all matters in this regard. “When that review is complete I will write to you in more detail in relation to the circumstances involved as requested. “In the meantime, the association will be happy to meet with you or your officials to review the association’s financial records in relation to the use of State funding. “The terms and conditions of grant approval require us to satisfy certain conditions. I can confirm, my understanding, that the association has utilised all State funding in compliance with the terms and conditions of grant approval. “As you are aware from our statement of March 30, 2019, the association has engaged with the Office of Director of Corporate Enforcement and it’s dealings with their inquiries. “The association has established a committee which I am chairing, to work with our external advisors to urgently address the matters of concern. 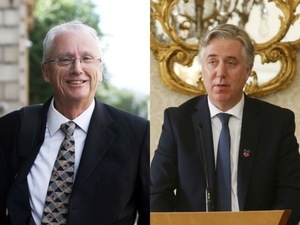 Fine Gael TD Noel Rock (top) said – following Mr Treacy’s opening statement, and his reading of the FAI’s letter above – that he wished to ask a question of the chair of the committee Fine Gael TD Fergus O’Dowd (above), given the “extraordinary letter” received by Sport Ireland. However, Mr O’Dowd said the committee had spent an hour fixing the protocol of the meeting and wouldn’t allow Mr Rock ask his question. Mr Rock, who said the “procedural” question was about correspondence received, called Mr O’Dowd’s response “extraordinary” and “deeply unprofessional”. “You seem to take a very soft kind of approach with the FAI, work with them if you like…but it doesn’t seem to be reciprocated and certainly this response [letter] would certainly give us this impresssion – this is one-way traffic. 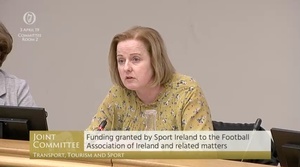 Ms Murphy also asked Mr Treacy what action Sport Ireland will take if, after further correspondence with the FAI, Sport Ireland is still not satisfied with the FAI’s response. “We have provided 50 per cent of funding to the FAI already this year, right. We have asked for this information, we will be asking again, tomorrow. “If we don’t get a response, we have a board meeting on Tuesday and the board will discuss it and it’s a matter then for the board to decide what action needs to be taken. Mr Treacy has told Mr Rock that the FAI sought early drawdown of funding in early 2019, 2018, 2017 and 2016. Asked if it raises flags in Sport Ireland, Mr Treacy said Sport Ireland is aware the FAI is “carrying large debt” but he said the “sustainability of the organisation is still moving forward”. Asked if Sport Ireland sought to meet the FAI to discuss the cash-flow issues, Mr Treacy said: “We would meet regularly with the FAI”. The committee heard they last met with the FAI in December. Mr Treacy confirmed to Mr Rock that on June 15, 2017, Sport Ireland approved a grant for the FAI and that on June 16, 2017 the FAI requested a drawdown of 25% of that grant. The committee heard on June 16, 2017, John Delaney’s €100,000 loan was repaid by the FAI. Mr Rock asked Mr Treacy if that struck him as “peculiar” or as a “serious cash-flow issue” within the FAI. Asked if Sport Ireland knows whether the FAI has sought further loans, Mr Treacy said that Sport Ireland has asked FAI if there is any other issue that has taken place or likely to take place but those questions weren’t responded to by the FAI. Mr Rock said the letter that Sport Ireland received this morning is “frankly insulting to your organisation”. Solidarity-People Before Profit TD Ruth Coppinger asked Mr Treacy who regulates the FAI. He said he didn’t raise it with the FAI as it was a “matter for the board [of the FAI]”. Fianna Fáil TD Kevin O’Keeffe – who secured two World Cup tickets, which he paid for, via Mr Delaney – asked if the €100,000 loan would be a high or medium priority for Sport Ireland. Mr Treacy said it’s a “very high-priority” matter for Sport Ireland and the body is awaiting the response from the FAI. Mr O’Keeffe then asked if the loan seems “illegal” to Sport Ireland. Mr Treacy said Sport Ireland has asked about the circumstances of the loan because they didn’t know anything about it. He said if there was a material deterioration in the FAI’s finances, they needed to know about it and to not be informed of a material deterioration in the FAI would be “a breach of our terms and conditions for funding”. 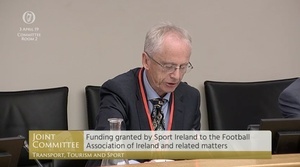 Posted in Misc and tagged FAI, Oireachtas sports commitee, Sport Ireland at 6:30 pm on April 3, 2019 by Bodger. 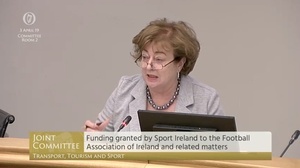 Representatives of Sport Ireland, which is responsible for the investment of public money in sport, will appear before the Oireachtas Joint Committee on Transport, Tourism and Sport at 2.30pm, to answer questions about the Football Association of Ireland. Chief executive of Sport Ireland John Treacy, in his opening statement to the committee, which Broadsheet has seen, will say that, of the €2.9m Sport Ireland gives annually to the FAI, it is satisfied that this funding is “fully accounted for and expended on the purpose for which it was intended”. However, he will also say that Sport Ireland knew nothing about the €100,000 loan from the FAI’s former CEO John Delaney to the FAI. That the FAI’s explanation to date has been “insufficient”. And that the FAI has also failed to respond to a second letter from Sport Ireland in which the body sought clarification about the loan. Mr Treacy will also say Sport Ireland knew nothing about the FAI paying €3,000 a month in rent for Mr Delaney over several years, while he was earning €360,000. And it knew nothing about the apparent deterioration in the FAI’s finances in 2017. Mr Treacy will also tell the committee that in relation to the stepping down of Mr Delaney as the FAI’s CEO, only to take up a new role as executive vice-president – just days after news of the €100,000 cheque broke in The Sunday Times – Sport Ireland were not consulted about this decision which the FAI say resulted from recommendations made in a review of the FAI by Jonathan Hall & Associates. Mr Treacy will say although the FAI put out a press release to that effect on the evening of Saturday, March 23 – the evening before The Sunday Times reported on the FAI’s rental payments – Sport Ireland wasn’t informed of the decision until it received a letter from the FAI on March 25. Mr Treacy will say Sport Ireland was neither consulted on the commissioning or preparation of the Jonathan Hall & Associates report and has not received a copy of it. “Following media reports concerning a loan of €100,000 to the organisation by its now former Chief Executive, and at the request of the Minister for Transport, Tourism and Sport Shane Ross TD, Sport Ireland wrote to the President of the FAI on 19th March seeking urgent clarification from the Board of the FAI on the circumstances of the loan and its repayment. “Sport Ireland also sought an explanation on why we were not notified at any stage in 2017 about any apparent deterioration in the FAI’s financial position, which is a requirement of the Terms and Conditions of Grant Approval. “Sport Ireland received a response from the President of the FAI, which acknowledged the loan of €100,000 to the FAI by its then Chief Executive. “On Monday 25th March, Sport Ireland again wrote to the President of the FAI re-seeking clarification on the circumstances of this loan. “More detail was also requested by Sport Ireland in order to assess compliance with the Terms and Conditions of Grant Approval. “Sport Ireland also sought re-confirmation that all state funding provided to the FAI has been spent for the purposes intended and in accordance with approved submissions. At the time of submission, no reply to the second letter has been received from the FAI. “The committee should note that, as part of the mid-year financial review of the FAI’s 2017 Financial Statements and in advance of the final tranche of 2018 funding being released to the FAI, Sport Ireland’s Financial Controller raised a query with the FAI in relation to their 2017 liquidity position (specifically the introduction of a bank overdraft facility of €1.3m and the increased net debt position in 2017). “The query was responded to by the FAI’s Director of Finance, who stated ‘the Net Current Liabilities position is a common annual position mainly driven by Deferred Income balances where advance funds from grants, sponsorship & commercial agreements are being released over the life of the respective agreement. The overdraft position at Dec 2017 was within our Overdraft Facility with our Banking partners and was a matter of timing rather than a liquidity concern – the balance has been in credit for the majority of 2018 to date. The Balance Sheet position was reviewed by the audit team as part of going concern procedures, including reviewing future budgets, and no concerns were raised’. Mr Treacy will also tell the committee that, over the past ten years, the FAI has been audited by Sport Ireland’s independent auditors on more occasions than any other sporting organisation. These Independent audits took place in 2010, 2014 and 2016, with all findings reported to Sport Ireland’s Audit & Risk Committee. Mr Treacy will also tell the committee that in 2017, its investment in the FAI represented about 5% of the FAI’s total annual income, with the other 95% coming from the FAI’s commercial activity including sponsorship deals, broadcasting and gate receipts. 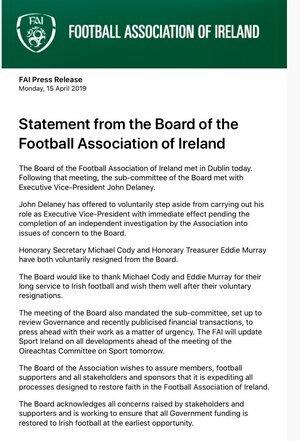 Posted in Misc and tagged FAI, John Delaney, Oireachtas Committee, Sport Ireland at 12:26 pm on April 2, 2019 by Bodger. During Topical Issues, the management, finances and funding of the Football Association of Ireland was raised. It followed the announcement of the FAI at the weekend that John Delaney would be stepping down as CEO but would be taking up a new role as executive vice-president. The FAI said the move followed the adoption of a recommendations set out in a review of its senior management structure – which was commissioned in February and carried out by Jonathan Hall Associates. 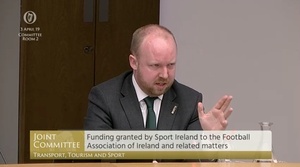 Fine Gael TD Noel Rock, who is also a member of the Oireachtas sports committee, told the Sports Minister Shane Ross no terms of reference for this report have been published to date and the FAI has “so far not even responded to our [sports] committee in looking for that report”. “Incredibly, minister, within six weeks, that report has been produced in its entirety, no redrafting required and the contents of it acted upon by a unanimous vote of the board, culminating in the announcement of a brand new position for John Delaney. “A new position for John Delaney, passed by an unanimous vote. “I met with an expert in sporting governance who is currently undertaking such a review with a sporting body in another jurisdiction. That review is coming to conclusion, that review took a year. “How could this review only take six weeks? “Why did the FAI act on it so quickly? Why can’t the FAI supply us with this report, given they already acted unanimously on an element of it? “Does the minister believe this is good corporate governance? “Does the minister believe that taxpayers’ money is being deployed effectively? “Does the minister not believe that now is the time for an independent examination into FAI corporate governance and finances. 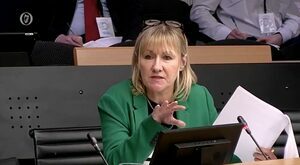 “On finance, I’ve spoken with current and former employees of the FAI, minister, and I am disturbed by what I’m hearing and the documents I am seeing. 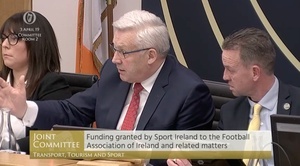 “While we continue working with these sources and readying ourselves to ask questions about what has previously happened within the FAI in our committee, on April 10, I believe that we need to act now to safeguard taxpayers’ money. “…we see in the public domain today, once again, that for 2019, the FAI requested an early drawdown of State funding from Sport Ireland – this is not the first time it has happened and no explanations have been forthcoming. “We also saw the revelation of an undeclared directors’ loan by Mark Tighe in Sunday Times. The question has to be asked: why was this necessary? Is it the only time it happened? Why wasn’t it declared? “Has the minister spoken to Sport Ireland on these matters, does he have any concerns with regard to the undeclared directors’ loan? Does he not agree that further taxpayer funding should be contingent on an independent examiner and an independent examination? “The original issue which thrust this issue into the public domain was one of borrowed money, minister, but it is quite clear that the board of FAI is now only existing on borrowed time. In response, Sports Minister Shane Ross said, in relation the loan provided by Mr Delaney to the FAI “have raised serious questions about governance and financial controls in the FAI”. He said Sport Ireland is currently engaged with the FAI to “clarify these matters” and “when the necessary clarifications have been received from the FAI” Sport Ireland will submit a report to him. Have seen a Whatsapp message doing the rounds about John Delaney's €100k cheque. It's all crap. Delaney and FAI have questions to answer but that's just nonsense. Stuff about Sunday Times's sources is untrue too. Don't believe these anonymous messages that get forwarded around. Posted in Misc and tagged Dail, FAI, John Delaney, Noel Rock, Shane Ross, Sport Ireland at 6:13 pm on March 28, 2019 by Bodger.